Michael Batty explains how the process of geodesign might be compared to one in which conflicting views about a spatial design can be systematically resolved in moving to a solution by using a simple network model of conflict resolution. Such models assume two sets of agents—designers or stakeholders, as well as land parcels or locations—incorporated with attributes of suitability that the stakeholders use to reach a consensus over the best design. He illustrates the idea with a “toy” problem of the redevelopment potential of eight sites in central London that are influenced by six distinct stakeholders. There are now many new methods for modeling cities that differ from the traditional approaches to simulating urban structure, land use, and transportation flows. As data has become richer and bigger and computers have become all-pervasive, with ever-increasing memories and ever-faster processing times, it has become possible to model the behaviors of individual objects that make up data aggregates, such as populations, that were the focus of simulation models a decade or more ago. Individuals that compose these populations can now be represented as distinct objects within computations, now usually being referred to as agents. Agents are essentially individual objects that have to be well-defined with strong identities and distinct from the environment in which they sit. These might be likened to the “atoms” that compose our cities, notwithstanding that what goes on inside the atom is hidden from our view. Although in cities agents are often considered to be human beings, it is quite possible to define them in terms of any distinct objects that compose a system. In particular, agents might be streets or buildings, components that make up the weather or vehicles on the highway, the bricks that a house is built from, or the pipes/wires that click together to keep our utilities functioning. Their definition is entirely dependent on the context, and in this sense, agent-based models or modeling (ABM) has emerged as a much more generic tool for simulation than most of the other approaches developed hitherto. Indeed, Esri has introduced a plug-in called Agent Analyst that enables users to build agent models that have a spatial component, which is the map in ArcGIS. To illustrate it, let me pose a hypothetical problem that we have studied in London’s financial quarter, or the “square mile,” where we have identified a typical problem of change and redevelopment of land use and building form that requires the agreement of several key stakeholders. This involves a cluster of buildings composed of residential, commercial, and hospital uses where we show and label the sites in question in the above illustration. This is a toy problem, but it could easily be scaled up to include many building parcels and land uses and many different stakeholders. As in any specific context, the model only comes into its own as a useful way of exploiting geodesign once we do scale up, and thus our toy model simply illustrates the method. The area for our design is around the original location of the central post office adjacent to St. Paul’s Cathedral and the new London Stock Exchange in central London. This is the notional center of the UK postcode districts. Here, Marconi sent the first public wireless signal in 1896, and John and Charles Wesley founded Methodism in 1738 in the street known as Little Britain. 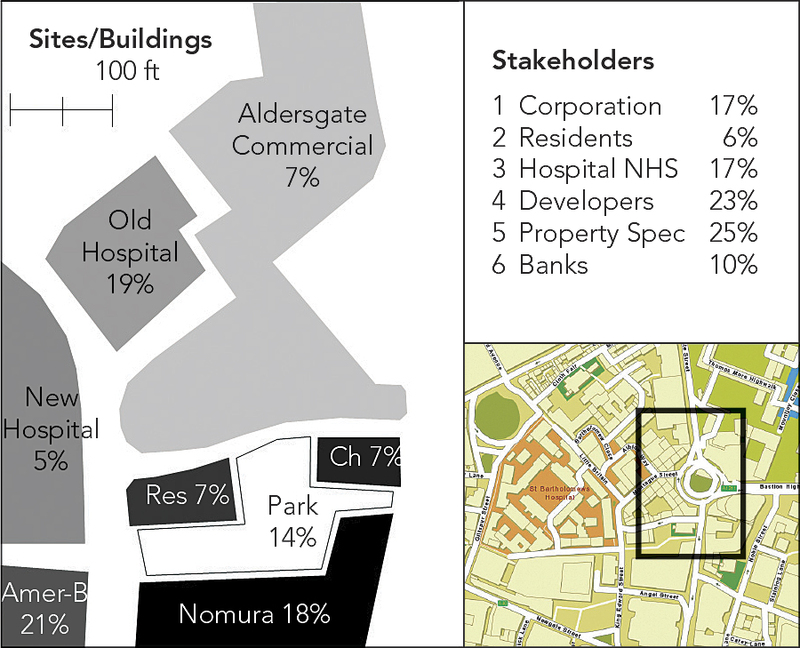 The area is composed of eight key sites: the Bank of America/Merrill Lynch and Nomura Bank, which occupy two of the old post office buildings sold off to the private sector in the last 20 years; a residential block built recently; two buildings of St. Bartholomew’s hospital, one of these just reconstructed and one ripe for redevelopment; a small Georgian church called St. Botolph’s; a large commercial block recently developed; and a pocket park of enormous charm. If you want to look at the problem more graphically, then see the PDF of my slides given when I presented a similar talk at the recent 2013 Geodesign Summit. We can now define six key interest groups—stakeholders—that all have some stake in whether or not these eight sites need to be redeveloped and/or change their use, which would involve some alteration to their building fabrics. The stakeholders are the hospital, in the form of the National Health Service; the residents; the banks; property speculators who continually dwell on high-value sites, such as those in this problem; developers anxious for lucrative redevelopment contracts; and the City Corporation (the municipality), which acts as the basic arbiter of all development in the city. Now each of these agents has a view about whether or not each of the eight buildings should be converted or redeveloped. If we then record these views as being in favor of change (1) or against it (0), then we can assemble a matrix or table where the rows are the stakeholder agents and the columns are the land parcels or sites, a second and different set of agents. 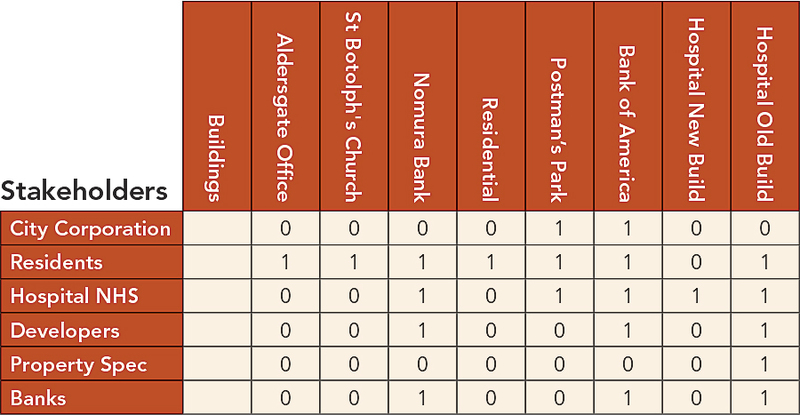 We can show this level of interest as in Table 1 below, where each row is the interest (1) or disinterest (0) the relevant stakeholder has in the redevelopment potential of the building parcel. Now, this matrix or table contains all the salient information about the design problem. This, in fact, is a set of maps. If you look at the table from the vantage point of each stakeholder—across each row—then each is a map of what the stakeholder thinks should be done in each parcel. One could easily imagine each row as constituting a set of grid squares from a 2D map splayed out as a vector rather than a grid or other 2D arrangement of sites. The second problem is defined when we look at each column, which is a set of what each stakeholder’s interest is in any particular site. The sums (∑) of the interactions given at the end of each row must be divided into the entries to get the fractional network weights. Now for the action—for the way the agents interact in moving to a consensus. We can swap each map (row in the initial matrix) for all the other maps linked to each agent in the network mentioned above and then average these maps—the opinions of stakeholders to whom each agent is linked—using the strengths of the links as weights. So for the City Corporation, the new averaged map showing the corporation’s new interest in the sites is formed by setting the weights proportionally to the strengths of the connections. So this would be 3/14, 1/14, 3/14, 3/14, 3/14, and 1/14, noting that these weights add to 1 to make the average of the maps of the stakeholders to which the corporation is linked. If we keep on averaging for all stakeholders in this manner, then eventually each map will converge to the same interest that each stakeholder shows in each site, and this would converge to the following values of interest, where we note that we have scaled these degrees of interest in each of the eight sites to add to 100: 7, 7, 18, 7, 14, 21, 5, and 19.